Would you like to see a wonderful step-by-step video series all about how to create mittens on the looms…in ONE piece?? 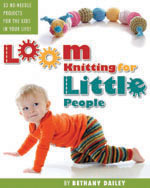 This entry was posted in Free Loom Patterns, Knitting, Loom Alongs, Loom Knitting, Looming Patterns, Tutorials. Bookmark the permalink. 24 Responses to Mittens on Knitting Looms! Thank you so much Bethany! It was a honor for me doing this video, you have so many wonderful patterns you really have a gift to create like this! Christina, I am new at this but after watching your video I really think I can do this. Thank you for the lesson! I’m confused. the Getting it Pegged site says to move every 3rd loop to the right and the ewrap the remaining 16 pegs with loops two over one. Your very useful video sees to skip this part maybe because the baby :). So on the combined pegs do you move the bottom two loops over the ewrap right? Yes, you’re exactly correct. The two loops get lifted over the top wrap. I think Christina was interrupted during this part of the process. 😉 From here on out, just follow the written pattern. One thing I was confused about when making the mittens was the Fingertip Shaping section. The video shows that you K1, E-wrap then knit off, K1. Is that what the E-wrap1 means? I was just e-wrapping it and moving on without knitting it off. In the Hand section of the pattern you wrote E-wrap Knit so I decided I was not to knit off the e-wraps in the Fingertip Shaping. I’ve enjoyed making the mittens. Now I’m off to finish them up! The video’s did help clarify this question. Thanks for the pattern! Thanks for the video’s! HI I’m new at this loom knitting and this is the first mitten I’ve tried. The mittens seem to be too big for my hand however. How do I make it smaller? If you don’t use all the pegs on the round blue loom to you have to knit back and forth instead of going around? You are very much on the right track with your smaller mitten idea! 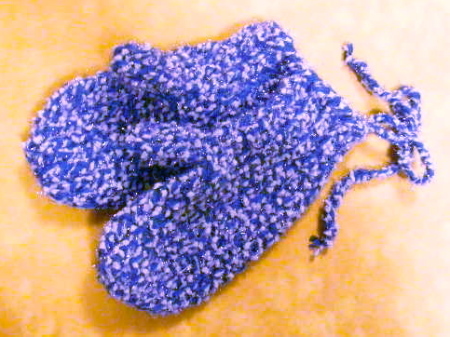 This mitten pattern was created before there was such a thing as the long Knifty Knitter looms with added loom clips. Now that we do have these adjustable type of looms, I would highly suggest looking into using them for creating mittens in varying sizes. The other benefit with the loom clips is that they can help you create much easier decreases at the fingertip area. 😉 Before these looms came on the market, we had to challenge ourselves to create the best fitting mittens we could with the round looms available. Hi Bethany, thank you for getting back to me – where do you purchase the knify knitters looms and clips? Horrible videos, I cannot understand what is co means? And the first video, I can’t even see what you are trying to do. Is it k1 or p1? Next time use thin string that can be read, don’t use homespun yarn because it is very difficult to watch and read from it. When you are making video, never work with them right next to bottom of the edge of video screen. I can’t see what you are trying to do. Plus, you do not provide closed captioning for this videos! It is not even helping me at all! Wow. It’s really unfortunate that you weren’t able to accept these videos as what they were: a first time video attempt by a fellow loomer who thought that others might be able to benefit from her particular experience looming my previously published pattern for making mittens. The videos were meant to be used while reading along with the written pattern, which, if you have in front of you, will make understanding what she is demonstrating much clearer. Is this a professional video series? No. Is this done out of the giving heart of a friend, fellow loom knitter, & and mom of little ones for whom she took time away from to make these videos in the first place? Absolutely! Polite manners take you a long way in this world, and I don’t see that you have displayed a single iota. This may be the practice on YouTube, but here in my corner of the web, it simply won’t do. I did not mean to sounds an insulting feedback. I had some frustrated with watching and read PDF back and forth for two days. This site only had the best loom projects that I have been using until this mittens. —Avoid using the you tube “cc” as automatically because they do not understand your voice or the way you speak. Usually causing a lot of garble words that were not making any sense. Use your own words such as subtitle or some kind of closed captioning system as speaking I heard it was easy to do that. —Keep loom demonstrate in center of the video screen as possible because there are some visual impaired such as blind people who still can see some. Deaf and hard of people, of course, uses their eyes to visual things. They do use loom. I tend to help them to work with hands-on. Thank you very much for revisiting your reply. A little bit of thought before commenting is always the best way to go. 🙂 Thank you, also, for your tips on creating a better tutorial video. It does help to know what the viewers think so that improvements can be made and a better experience had by all. I have been looming hats and scarves, and wanted to try this mitten pattern. I thought that the videos were very helpful. I am just starting my first mitten on the 24-peg loom. I had to watch the videos several times, since it’s easier for me to learn that way and take my own notes than to read the patterns. I think Christina did a great job. Love the pattern and video! My daughter is 7 and we started knit looming together. She made the hat using the pattern that came with the loom. When I found this pattern I was excited to see the video with it. It’s helped both of us learn to read the pattern and understand what is to be done next. She is very excited to have mittens that she made to go along with her hat. She receives many compliments, especially when she tells people that she made them. I’m one proud Mama! Thank you so much! I started loom knitting about 6 months ago and ready to move beyond hats, scarves and shawls. This is perfect, Bethany. And I certainly need the videos by Christina.Thank you both! Thank-you for the great tutorials on mittens, turning and binding off. Just in time for helping fulfill a request to help the needy in the area (hats, mittens, and scarves). It helps to see how it’s done. Thanks again! Thank you for this pattern and the video tutorial! I can’t wait to make some mittens! !